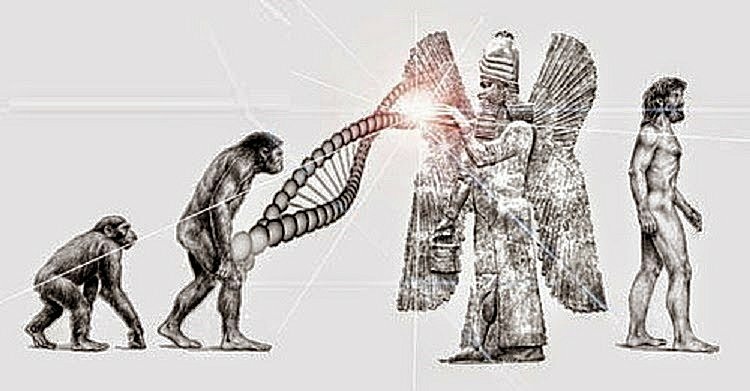 Enuma Elish is the Babylonian creation myth, which is known to be the oldest among all existing theories about the creation of the world. If not the oldest, then one of the oldest stories that concerns the birth of god and creation of the universe and human beings. The Enuma Elish is also known as The Seven Tablets of Creation, the title of which is derived from the opening lines of the piece, ‘When on High’. 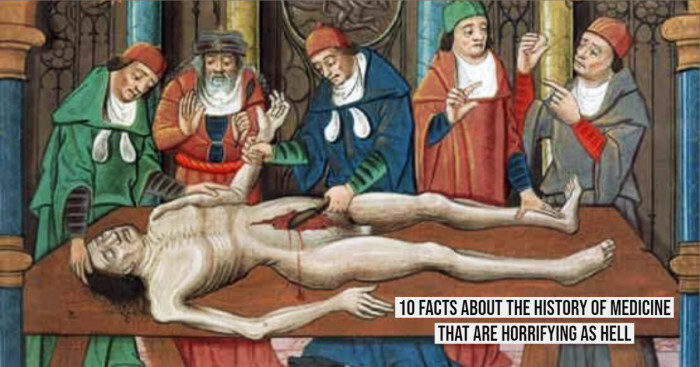 All the tables containing the myth dates back to c. 1100 BCE. Their colophons, however, indicate that they were copies of a much older version of the myth. They were found at Ashur, Kish, Sultantepe, Ashurbanipal’s library at Nineveh and other excavated sites. Traveler and archaeologist Austen Henry Layard recovered these tablets in the ruined Library of Ashurbanipal at Nineveh in 1849. 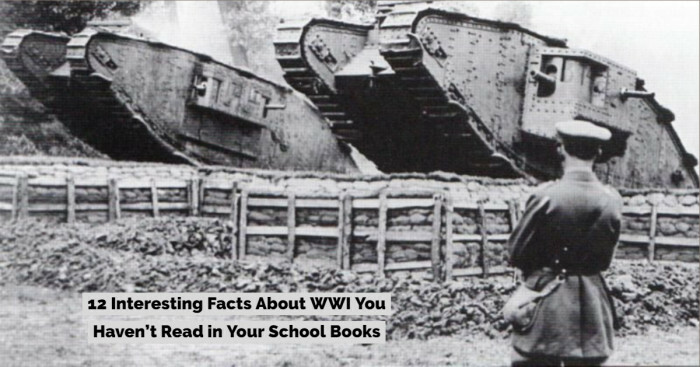 It was published in 1876 by George Smith. 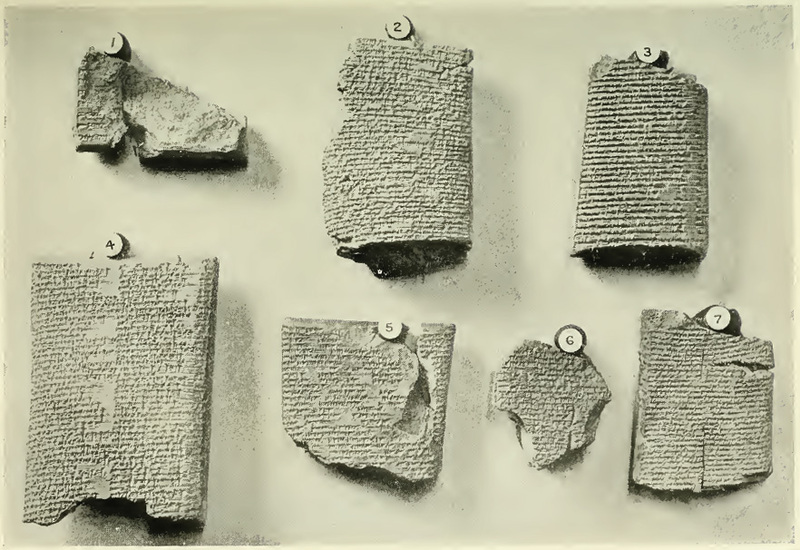 There are many copies of the Enuma Elish from Babylon and Assyria. The version from Ashurbanipal’s library dates to 7th century BCE. The text was probably composed in the time of Hammurabi i.e. Bronze Age or the early Kassite era, although some scholars favor the later date of c. 1100 BCE. The script was about a thousand lines that that was recorded on seven clay tablets in Old Babylonian. Each tablet had 115 to 170 lines of Sumero-Akkadian cuneiform script. Out of the seven tablets, most of Tablet V has not been recovered but apart from this lacuna, the text is mostly complete. Enuma Elish is centered on the supremacy of Marduk. He was a late generation god from ancient Mesopotamia and the patron deity of Babylon city. This epic is one of the important sources for getting acquainted with the Babylonian worldview. 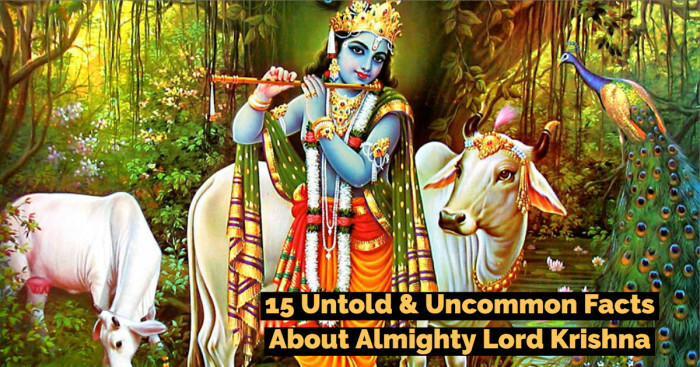 Creation of humankind for the service of gods can also be well understood with through this epic. The primary purpose behind this creation theory is not the exposition of theology but the elevation of the chief god of Babylon 'Marduk' above other Mesopotamian gods. Enuma Elish is often compared to the creation account in Genesis. Genesis creation narrative is the creation myth of both Christianity and Judaism. Babylonian god finished his work in 6 tablets of stone and Genesis reports six days of creation. The seventh and the last of Enuma exalted the greatness of the deity’s work while Genesis reports the seventh day as Rest of God. Tablet six of the Enuma Elish states the formation of mankind and in the Genesis account - Adam and Eve were formed on the sixth day. The formation of earth and sky was mentioned in Enuma Elish on Tablet IV while their separation was accounted for on day two of the Genesis. Tablet V of Enuma Elish talks about the creation of sun, moon and stars to mark seasons and the Genesis mentions this on day four. These similarities are undeniable but there are also many major differences between the Enuma and Genesis. Apsu (freshwater god) and Tiamat (sea goddess) were the two primeval gods. Other gods representing the horizon, Anshar and Kishar are born. They form the boundary between earth and sky. The sky god Anu is born to Anshar and Kishar, who in turn bears Ea (goddess representing Earth). These gods turn out to be so ill-mannered that Apsu determines to slay them. Before this could happen, Ea kills Apsu and establishes her above his body. Tiamat transforms into a raging avenger of her husband and takes the new husband Kingu for fulfilling her purpose. Meanwhile, Marduk (city god of Babylon) is born to Ea. Being the goddess of the sea, Tiamat represents malevolence and chaos. She must, therefore, be challenged and subdued. Ea confronts with Tiamat but fails. She is then challenged by Anu but even the sky god fails to defeat her. Marduk is selected to find the raging Tiamat. His ability to remake a destroyed garment made him worthy of this position. With great power and authoritative words, Marduk slays the sea goddess into two. With one-half, he forms the sky and earth with another one. Marduk places the celestial bodies and establishes the calendar to establish days, months and years. Tiamat’s second husband and her commander-in-chief Kingu is also killed and with his blood, forms the mankind, which is assigned to perform menial tasks for the gods. The last tablet describes the elevation of Marduk as the chief of Babylon and the head of Babylonian pantheon because of his role in creation. The other gods of Babylon take a rest forever. Didn't you find any similarities between this story and the creation story of Maori mythology? 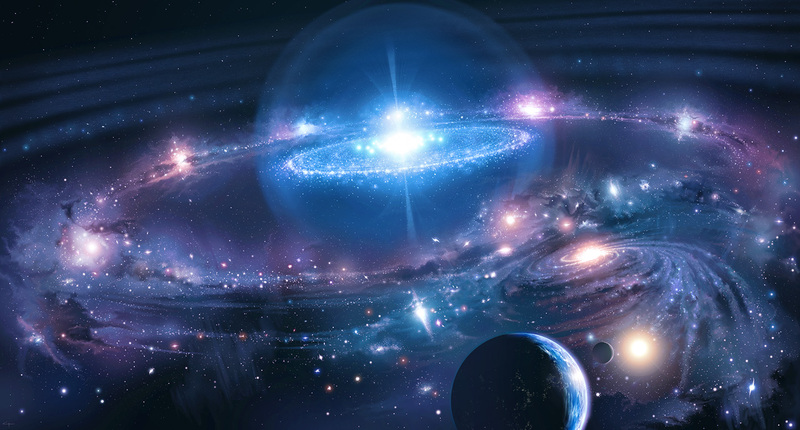 Like the Greek Theogony, Enuma Elish creation story also begins with the universe in a formless state. Two primary gods emerged from this state. Apsu, the male “begetter” is the sweet fresh waters while Tiamat, the female “maker” is the bitter salt waters. These two waters mingle at the mouths of Tigris and Euphrates rivers (site of the Mesopotamian civilization origins). According to some translators, the word ‘maker’ in line 4 is not an adjective used for describing Tiamat but another god, named Mummu who emerged at the same time. Besides being Apsu’s vizier, Mummu is the undifferentiated substance from which things are made. In order to fulfill the birth creation process, this power is necessary. When the waters of Apsu and Tiamat come together, Lahmu and Lahamu (slime, mud) emerge. From this pair of gods, came another pair Anshar (whole sky) and Kishar (whole earth). This can also mean “the horizon, circular rim of heaven and earth” (Jacobsen 168). Anshar and Kishar gave birth to the sky god, Anu who in turn begets Ea (trickster god of flowing rivers, familiar to us as Enki). Ea was stronger than his father and he was very fond of playing and running around with other new gods. This noise and commotion by the younger ones roiled Tiamat's belly (Jacobsen 179). Apsu got very angry with their noises but like other moms, she was much better with the noise than dads. Apsu and vizier Mummu suggest Tiamat destroy the young ones since their noise keeps him from sleeping. Despite her objections, the two plot against the younger gods. However, clever Ea overhears them and plans for their defeat. Ea creates and recites a magic spell that puts Apsu to sleep and Mummu in a daze. He takes away Apsu’s belt, crown, “mantle of radiance” and his insignia of power; puts them on him and kills Apsu. He leads Mummu like a captive slave by a nose-rope to his private quarters. These quarters are a combination of temple and house, built over the sweet waters controlled by Ea. It was also the same place where Marduk, the chief Babylonian god was born to Ea and his wife Damkina. Marduk means ‘son-child’ or ‘son-of-the-sun’. He was originally a local Babylonian god who was raised to the chief god status when Babylon conquered whole Mesopotamia. Marduk is more powerful than his father. He is very large with four large eyes and four big ears. Fire blazes from his mouth when he speaks. 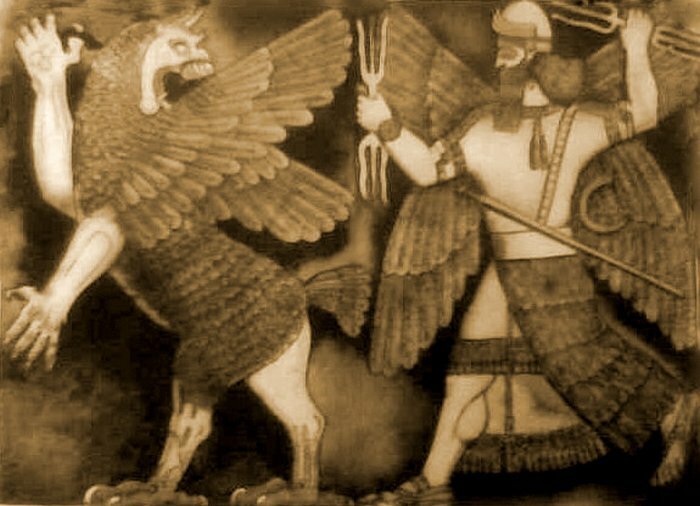 Proud and doting grandfather Anu creates four winds for Marduk to play with and soon many unnamed gods go to “their mother” Tiamat for complaining about the noise and commotion. Tiamat’s belly is also really roiled up this time. Tiamat decides to aid the unsatisfied gods and also avenge the murder of Apsu with her plot to do away with Marduk, Ea, Anu, and their kind. 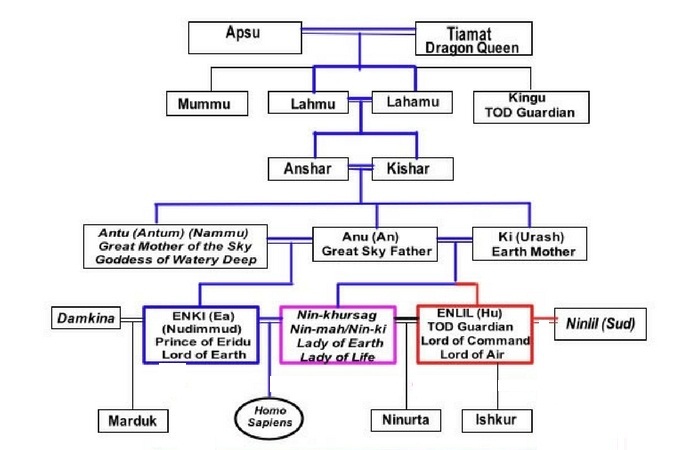 Also being “Mother Hubur” which means ‘river’ and is the also the name of an underworld river, Tiamat gives birth to 11 monsters for defeating Marduk. Tiamat’s army is headed by a god named Kingu, who is also her second husband. She gives him the “Tablet of Destinies”. It symbolizes supreme power over the universe. Kingu now had the power to fix destinies. When Kingu has this power, he is basically fighting with Marduk for the powers to shape up the universe. While handling over the tablet to Kingu, Tiamat said - "Your utterance shall never be altered! Your word shall be law!" Ea hears the whole plot and delivers this news to Anshar. Anshar sends the wise and powerful Ea to cease Tiamat but his mission fails. The next is Anu but even he fails. The gods sit silently for a while and then Marduk comes forward to defeat Tiamat. But he has one condition. He demands kingship over the whole universe. The gods agreed upon his terms but conducted a test of his powers. They set up a constellation in some unspecified way and asked him to command those stars. Marduk was successful with his tasks and set out for the battle to achieve his kingship. 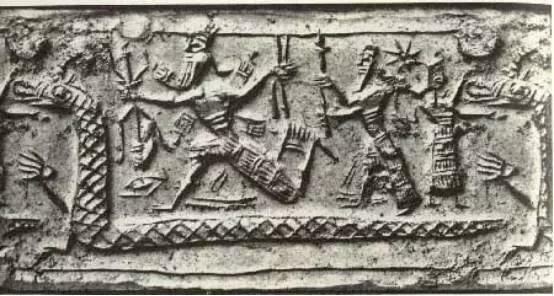 With weapons and powers, Marduk is done with such preparations that Kingu and the rebel gods are afraid to seeing him approaching with his chariot. Marduk raises his rain-flood weapon which was the mightiest of all weapons, created with seven nasty new winds, and challenges Tiamat for single combat. Accepting the challenge in all her anger, Tiamat advances while shouting his spells. Marduk encircles the sea goddess with his net, blows her up with his winds and shoots an arrow splitting her down from the middle. Standing at Tiamat’s corpse, Marduk easily defeats rest of the army. He ties the monsters and leads them with nose-ropes, takes away the Tablet of Destiny from Kingu and then creates the universe from Tiamat’s body. Marduk sliced Tiamat in half. He put half of her to roof the sky. Sky here is seen as solid that holds back her waters. He builds his own temple in the sky as a mirror image of Apsu. He sets up the constellations as stations for each of the greatest gods. Marduk creates east and west with the two ribs of Tiamat. With her liver, he creates pole star. Marduk creates the sun and the moon and organizes their daily and monthly cycles. Clouds, rain, and fog are formed from Tiamat’s spittle. Heaping a mountain over Tiamat’s head, Marduk pierced Tiamat’s eyes to form the origin of Tigris and Euphrates rivers. He heaps mountains over her udder and pierces to make rivers from eastern mountains that flow into the Tigris. The goddess’s tail was bent up to form the Milky Way. Her crotch used to support the sky. After creating the universe, Marduk leads the captive gods and monsters before the sky gods. He makes statues of those eleven monsters, setting them at the door of Apsu and also presents the Tablet of Destiny to Anu. Gods are extremely pleased with the new king and so they arrange a reception for him where all come forward to kiss his feet. They proclaim him with the heaven and earth and present him with the regalia of his office. Marduk creates his own dwelling place between the skies of heaven and waters of Apsu, which is named as Babylon (meaning the “gate of god”). All the gods bow down to him and promise to obey his command. Marduk outlines a plan to perform miracles and create ‘man’, who shall be charged with the service of gods. Ea suggests slight alteration in the plan that they should create humans from one of the rebel gods. All gods had a unanimous decision. This god shall the one who incited Tiamat and started the war – Kingu. Ea cuts Kingu’s arteries and from his blood, makes the mankind. He imposes gods upon mankind. Marduk assigns gods with various positions in heaven and earth. In expression of their gratitude towards Marduk, the gods decide to Babylon. They set about arranging bricks and raising Marduk’s temple. Marduk organizes a big feast for the gods in his new home. They fix all destinies including the ‘seven destinies of cult’. The bow that killed Tiamat in the war is presented by Marduk to the gods. Anu is so pleased by this gesture that he makes the bow and honorary god and gives it a seat in the assembly of gods. All the gods swear fealty to Marduk. They chant his fifty names, thereby confirming his kingship and mastery. What are your views about The Enuma Elish? If you have read any other creation story, share them with us.